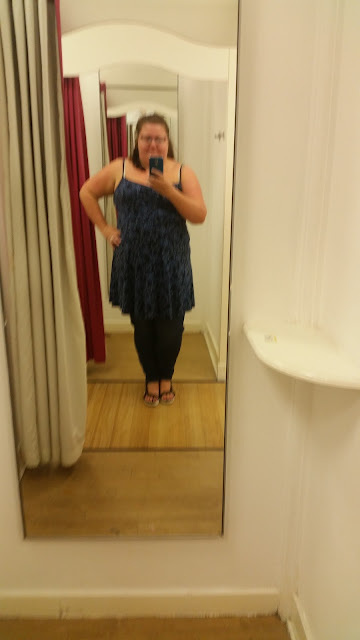 I was in Skipton over the weekend and it is sadly lacking in Plus Size clothing. 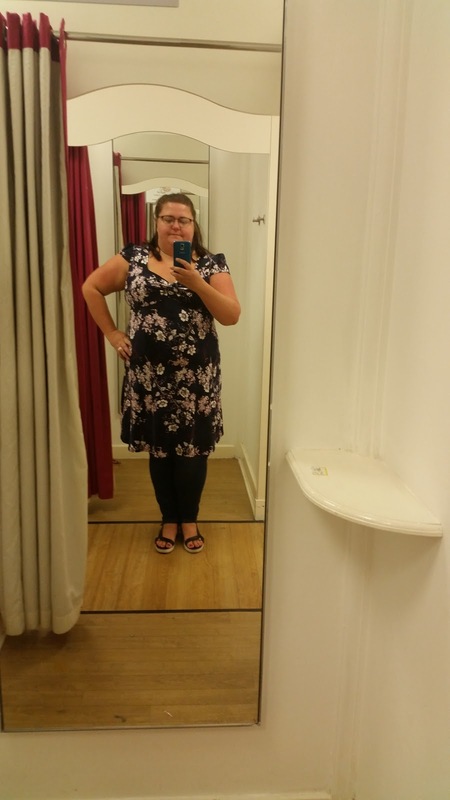 If you want over a size 22 you are sadly out of luck in most shops. 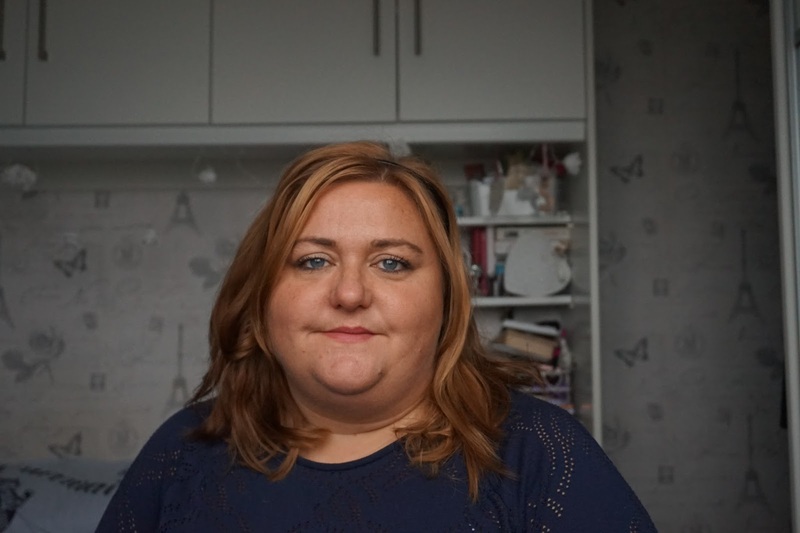 There is a House of Fraser (Rackhams) which has some 22's, Next, a New Look with up to 18 and the occasional inspire item on the sale rail which has been a return and that's about it other than Dorothy Perkins. I found a few things on the size 16+ section of the sale rail (could they not get more signs printed? They only stock to a size 22) I wanted to try on and as the changing rooms were empty and quite light I decided to do another Tales From The Changing Rooms Post. The first dress I spotted was from the Tall range and I think the colours and neckline make this dress. 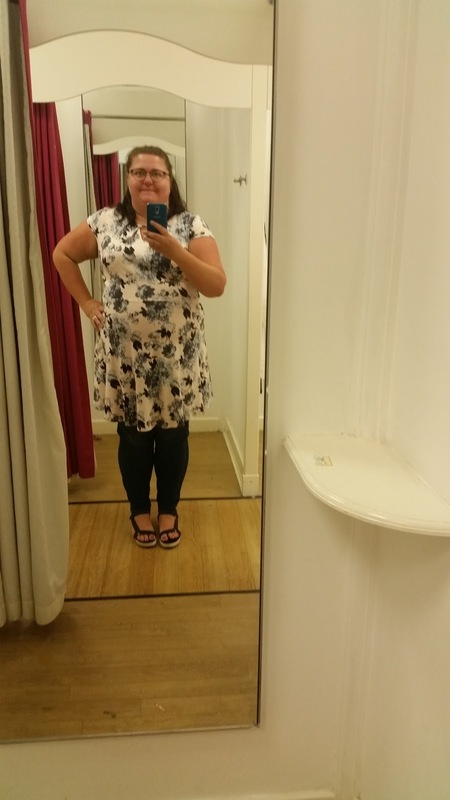 It had been reduced to £10 and I knew I wanted it before I tried it on. The stitching across the bust was a little dodgy and part of the overlocking was on the outside. The woman on the till overheard me asking my mum if she thought the dress would unravel if I cut the treads and said she could knock another 10% off (making it non-returnable). For £9 it was worth the risk. Next up was a blue and black sundress. I took lots of pictures of me in this dress and this is the best one. I really like this dress and my mum owns it but it didn't sit right on me. the straps needed to be shorter for it to hang better. This dress is really out of my comfort zone, I rarely wear pale colour on my bottom half, not because I think it will make me look fat. I am fat not sure that's easy to disguise! I'm messy, a dirt magnet. Likey to have a heavy period without any warning. Sit in a puddle of chocolate (lets hope it's only chocolate). I thought about it for a couple of hours then because I needed to go back in to buy a t-shirt as the one I was wearing got rain soaked and stretched past the point of decency I bought it. it's a 22 and was £12. 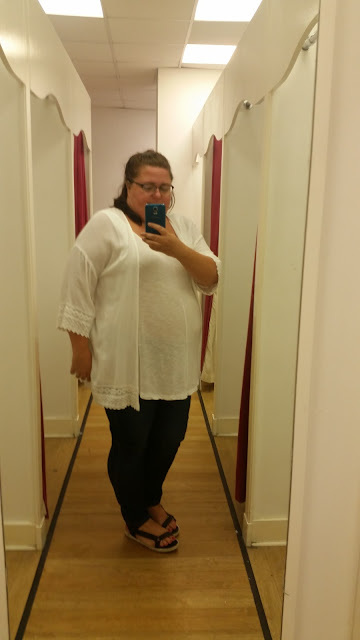 The last thing I tried on was a white kimono jacket, they only had it in medium which was too small but I'm on the fence if I like it or not. I'm going to see if I can find one in a large / Extra Large this weekend and see how I feel about it. What things have you been trying on recently?